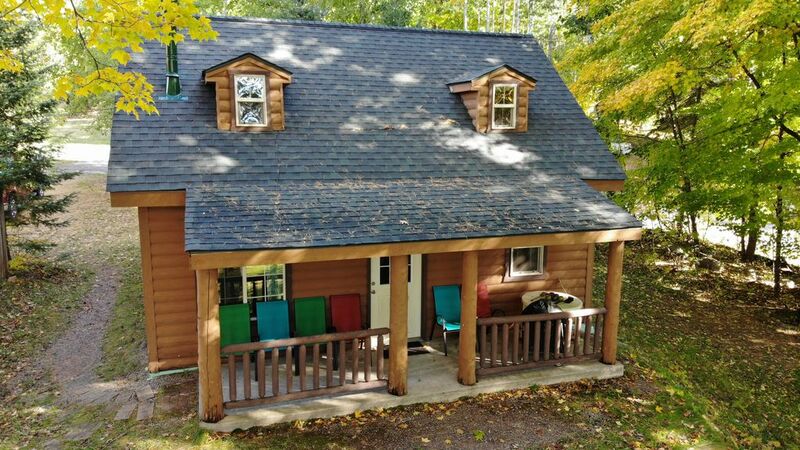 The Beautiful Musky cabin is located on Moose Lake, a 1,670 acre, dark water flowage surrounded by the Chequamegon National Forest. Perfect for family or couples looking to escape the hustle of modern living, or explore the wide expanses of wilderness surrounding the cabin. Located close to Hayward. Watch for deer, eagles, loons, turtles, swan, fox, chipmunks and all types of birds! Great location for fishing, swimming, hunting, snowmobiling, cross-country skiing. A large yard on the lake leaves plenty of room for campfires and smores, or relaxing down by the lake with your favorite beverage. 1 Bedroom separated by a privacy wall (Queen, and full bunk/w single) with additional open loft (full, and fold out couch). 1 Bathroom with shower. Clean and fully stocked kitchen, and loft (with Direct Tv Now and DVD) to unwind at end of the day. A deck with gorgeous views for gatherings or dinner overlooking the lake and river. Large open yard for relaxing by the water with a swing set for the little ones to play. Enjoy our canoe for a nice paddle on Moose Lake or up the river to explore. Property includes a dock for you to swim off or tie your boat up to after a fun day out on the water. During summer rental period we only rent from Saturday to Saturday. After living in Hayward for the past 15 years we decided we wanted others to experience the beauty and tranquility of the Northwoods. We have had a place on the water and know you will find this property to be the perfect setting to get away from it all and relax in some of the prettiest settings you will see. We want you to have the best experience possible. Please feel free to contact us with any questions or even suggestions for what to do while in the Hayward Area. We instantly fell in love with this cabin after seeing the location. From the beautiful views of Moose lake and the Chippewa river flowing right into it next to the property, to the sounds of nature, we were hooked. Yes, for each of the beds. For sanitary reasons we remove all food items after each guest. Please plan to bring spices, cooking oil, etc. Very quiet here during our late winter stay. Easy access to the snowmobile trails. The area is beautiful and the people were friendly. We had to cut our stay short due to warm weather and the owner was very responsive. Hope to stay here again! We rented the cabin in March to snowmobile in Hayward area. The cabin worked out perfect for my husband and I. It also would have been big enough for a family. We had plenty of room for our 16 foot enclosed snow mobile trailer. The snowmobile trail is just down the road, easy access in and out! I rented the cabin for a long cross country ski weekend with my 2 kids. The cabin was clean, cozy and worked well for the 3 of us. The views are spectacular. Derek was incredibly responsive and very helpful. I would rent this cabin again for sure. I would agree with other reviews that the cabin is a lot more intimate than it appears in the photos. For myself and my kids this wasn't an issue at all, but you should know that there's very little privacy in the open format of the bedrooms and the rest of the cabin. Also, the cabin is pretty close to neighboring cabins (though it's on the very end of the cabin cluster). For the winter time, this was not an issue as I don't believe any of the other cabins were occupied. In the summer, this could get busy. Lastly, for skiing the cabin was a 30-minute drive to the Birkie trailhead at County Road OO. Suited four guys just fine for a weekend musky trip. We were able to tie up two boats on the dock. Beautiful lake but it's a little tough to fish, especially in blowing snow and 15+ mph winds. Hope to come back. It's a nice quiet get away. Definitely a fishing spot! Cabin was clean, and cozy. Colors were in full form, and we enjoyed the lake view. My daughters and I stayed there. It was farther from town than we thought, but the cabin was fine.